article “the principal scholarly article on the subject” and in Padilla v. Kentucky, 130 S. Ct. 1473 (2010), which agreed with his contention that the Sixth Amendment required defense counsel to advise clients about potential deportation consequences of guilty pleas. Justice Sotomayor cited his Penn Law Review article in her dissent in Utah v. Strieff, 136 S. Ct. 2056, 2070 (2016). He teaches Criminal Law, Criminal Procedure, and Immigration, and is Director of Clinical Legal Education. He also works with students on professional projects. His efforts with students to repeal Jim Crow laws still on the books includes a successful 2003 petition to the Ohio legislature to ratify the Fourteenth Amendment, 136 years after the state disapproved it during the ratification process. He and his students also achieved the repeal of anti-Asian alien land laws which were on the books in Kansas, New Mexico and Wyoming. For this work, "A" Magazine named him one of the “25 Most Notable Asians in America.” In connection with classes with a practical component, he has tried felony cases and argued criminal appeals with his students. Professor Chin earned a B.A. at Wesleyan, a J.D. from Michigan and an LL.M. from Yale. He clerked for U.S. District Judge Richard P. Matsch in Denver and practiced with Skadden, Arps, Slate, Meagher & Flom and The Legal Aid Society of New York. He taught at the Arizona, Cincinnati, NYU and Western New England law schools before joining the UC Davis faculty. 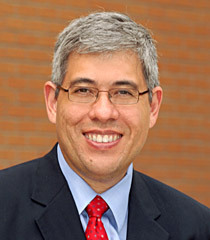 His professional activities include service as Reporter on the Uniform Collateral Consequences of Conviction Act, approved in 2009 by the Uniform Law Commission, and for the ABA Standards for Criminal Justice: Collateral Sanctions and Discretionary Disqualification of Convicted Persons (3d ed. 2003). Chin is a founding board member of the Collateral Consequences Resource Center and a member of the American Law Institute. Hong Yen Chang project. Professor Chin and the UC Davis APALSA successfully obtained posthumous admission to the California Bar for Hong Yen Chang, the first Chinese American lawyer in the United States. In re Hong Yen Chang, 60 Cal. 4th 1169, 344 P.3d 288 (2015), overruling In re Hong Yen Chang, 24 P. 156, 84 Cal. 163 (1890). Represented by the UC Davis California Supreme Court Clinic and then the law firm of Munger, Tolles & Olson LLP, the project was honored by the APA Bar Association of Los Angeles in 2016, and by the Asian American Bar Association of Sacramento in 2015. Details and documents can be found at Gabriel J. Chin, Hong Yen Chang, Lawyer and Symbol, 21 UCLA Asian Pacific American Law Journal 1 (2015-16). The story was covered on NPR's Morning Edition and in Maura Dolan, Chinese Immigrant, Denied Law License in 1890, Gets One Posthumously, L.A. Times, Mar. 16, 2015. Chinese Restaurant Project. Professor Chin and John Ormonde '14 identified a previously unknown effort to eliminate Chinese restaurants from the United States using legal techniques from discriminatory zoning to prohibitions on white women working or dining in Chinese restaurants. Their paper, The War Against Chinese Restaurants, will appear in the Duke Law Journal. The research was discussed by NPR, howstuffworks.com, Diverse Issues in Higher Education, Colorlines, and The Bob Zadek Show. A shorter version was published by the Cato Institute's Regulation magazine.